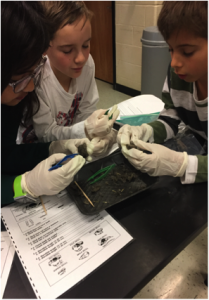 Science Lab – MESF: Murdock Elementary School Foundation Inc. 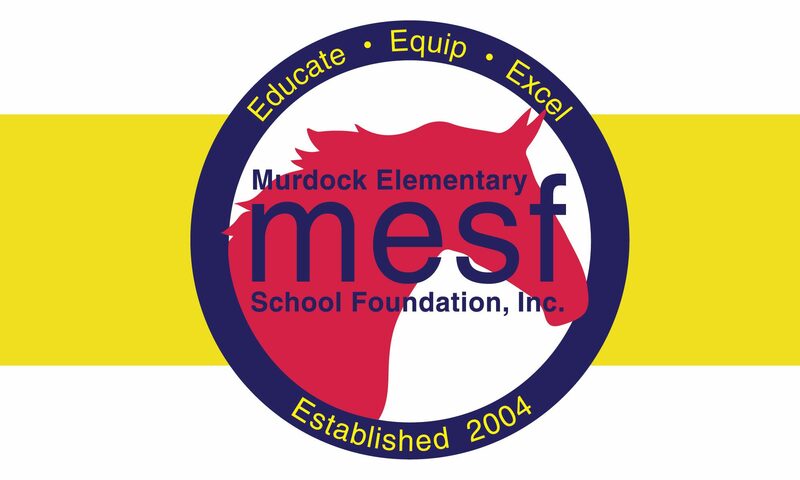 The Murdock Science Lab is fully funded by MESF as part of our mission to provide resources that will enhance the learning environment and educational opportunities of the students at Murdock Elementary School. In addition, Murdock’s Science Lab Garden has been consistently featured at Cobb County’s Master Garden Symposium and has been the only school garden to participate in Cobb County’s Tour of Gardens. Congratulations to all the participating students for working so hard. This took much responsibility! Thank you to the parents for their support in science and preparing our future. Kids need knowledge, creation, and innovation to explore, experiment, and find interesting solutions to complex problems as they grow and going through the science fair builds these qualities. We are looking forward to students to invest their time in this worthy competition for 2020! Our volunteer judges were mainly from the science field including several doctors (medical and engineering), professors from Kennesaw state, food engineers, and our Terrific Kids afterschool science club directors, to name a few! Their remarks centered on how impressed they were with the children’s work and communication skills. 3rd- Leo Schmidt –Spinning Tops: Does weight Impact the Top Spin Times? 2nd-Kingshuh Ganguli – How Much Salt Is Needed to Float in Water? 1st- Abree Park-Pom Poms Away! 3rd-Will Strydom- What Makes Shiny Pennies? 3rd- Marjorie Davis- Candy Crack! 2nd- Devansh Kant- Will It Glow? 1st- Elizabeth Reida- How Many Air Tubes Do I Need To Have To Feed the Fish? 3rd- Akshadha Mehta- Can the Color of a House Reduce the Energy Bill? 1st- Ravi Patel- Woo Took My Dirt? 3rd- Andrew Reida-How Does Food Effect You Blood Sugar? 2nd-Sophia Vatistas- Density: Will it Sink? Or Will It Float? 1st- Micah Park – No Umbrella? No Problem! 2nd- Una Tesovic- How Hig Can I Drop An Egg on the Mattress with No Cracks? Congratulations Murdock Mustangs family! The First Place Winners will move onto the County Fair February 9, 2019. Well another quarter has finished and one great thing is that we have had so many fun exciting happenings in the science lab. Science fair preps took place as enrichment! 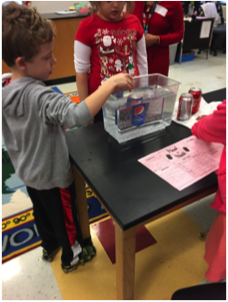 The intermediate lab searched for the relationship of mass and density using soda cans in tap water to observe the effects, thus sinking or floating. The primary students experimented with magnets to test if the size of a magnet matters; following the scientific process. The challenge for each group was to make a real-world connection with their hypothesis and conclusion. 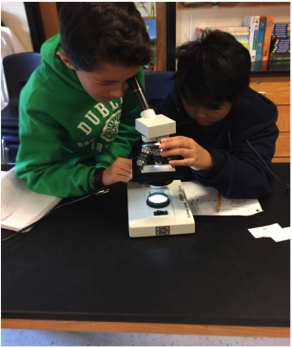 Fifth graders have spent most of their time using microscopes searching for details of microorganisms to understand that they are both helpful and harmful. They made diagrams to communicate their findings with their classmates. Many students have never used a microscope and this gave them some time for exploration. While studying ecosystems, fourth graders dissected an owl pellet to define the food chain and explain the environment of that owl. An owl pellet is the regurgitated undigested portion of the owl’s diet; hair and bones. While many students relished in the dissection, some were skeptical! All were able to take home the bones extracted from the pellets. As paleontologists, third graders focused on fossils and minerals. They excavated parts of the earth in a fossil dig where they acquired minerals and fossils to bring home. This was a whirlwind of dust and fun which they couldn’t wait to explore each time they came! It seems to have been their first time with googles too! 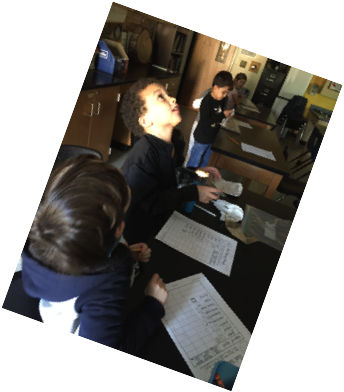 Second graders explored the properties of stars. It is a challenge to focus on gases so far away from our planet, but they gained the understanding that while the sun was brightest star it is not the biggest, just the closest. We used our creativity to name a new constellation and tell a legend of how it got placed in the sky like the eighty-eight named ones. I provided a homemade star finder for them to locate these in the night sky. Happy star hunting! We had opportunities to discover that light travels in a straight line with first graders! Using flashlights, the students explored what makes a shadow, that shadows can grow and shrink, and light can pass through some objects too! Hopefully they came home asking to show you what they learned and asked about things they still wonder. Kindergarteners made a model of the sun, earth and moon with paper plates and paper fasteners. They were challenged to rotate the earth to figure out day and night while learning that the earth revolved around the sun as well. How many times have you orbited the sun? The moon played a part in the movement, orbiting the earth approximately every 28 days. It is always an awakening to them that the moon is a rock and doesn’t make its own light. We finished the lessons with a night sky model using corn syrup, glitter, confetti stars, and blue food coloring in a baby food jar! They enjoyed themselves and learned so much! In science lab, the students have been exploring different benchmarks from fifth graders using the engineering design model to create, build, test, and redesign to kindergarteners using physical properties of matter and forces that cause movement! 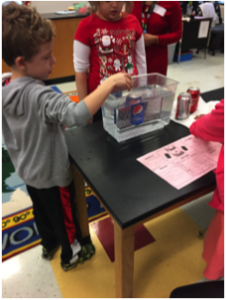 While there is no doubt that the second graders are excited about experimenting with the properties of water, they cannot believe how easily it can move on wax paper, or how fast its molecules can move food coloring throughout an entire cup. The biggest surprise seems to be that water is so sticky it can hold as much as 25 drops or more on the head of a penny. Weather is the topic first graders find interesting as they create tools scientists use to measure the water, wind, and sun. Rain Gauges, anemometers, and thermometers have kept them busy in the lab while singing, “Weather Changes”. Third graders are finding out about the different types of soil and which old the least/most water for growing plants. They are creating edible rocks to learn the process the earth uses to form the three major rocks, igneous, sedimentary, and metamorphic. It is has been an exciting few weeks! It’s that time again to begin your science fair project. Please consider participating! Working on a science project at home is a great way to have fun learning along with your child the key concepts of science. The Murdock Science Fair is January 16, 2019. The first thing to do is to discuss this with your child; consider a problem that you may have noticed and wondered why it seems to be happening or wonder about an area of science you are most interested. There are mainly three branches of science; physical science, life science, and earth science. Reading is the first step to realizing what problem to solve. Write down questions as you are reading. Then choose one to design a test to answer the problem. The project must have a problem to solve with a “real-word” connection. Rather than picking a project to fulfill an assignment, choose something that will make a lasting impression. One example is a student of mine loved robotics and noticed a problem within her home security; the motion sensors within her home didn’t capture her movement at a low level near every entry so she developed a robot to monitor such. Then she designed a test to perform to develop a theory about the motion detection robot. Your project must be tested AT LEAST THREE TIMES to be considered reliable. 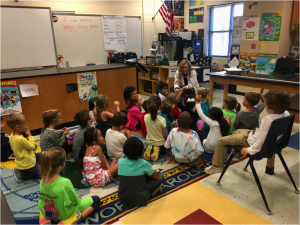 There are many things to consider regarding safety as well as district requirements to move on to the Cobb-Paulding Regional Fair in March 2019. First and foremost the display board size must not exceed 30 inches deep, 40 inches wide, and 72 inches tall (from table to top). For the safety of all, MANY objects are not allowed on the science fair board. We cannot do projects related to growing mold or bacteria, so getting your project content approved by me will be important BEFORE you begin. Just have your child bring their (written) purpose to me for approval to begin. Let me know how I can help you make this a fun learning experience! We have a new Science Lab Teacher and her name is Rosemarie Gondek. She relocated from Florida to be with her son, his wife, and her wonderful grandchildren after teaching in Palm Beach County for thirty years. She brings a wealth of knowledge and experience to the lab. As a two-time National Board Certificated Recipient, she has served as president of Palm Beach Science Educators Association, participated in the PBC District science fair committee, and served as curriculum consultant for Houghton Mifflin Harcourt. She is a teacher-trainer for Project Wild and a huge advocate for the environment! She hopes “to serve this community with integrity, passion, and creativity!” She is looking forward to collaborating with your child’s teacher and is excited to inspire students to find science everywhere! Please help us welcome her to our wonderful community.